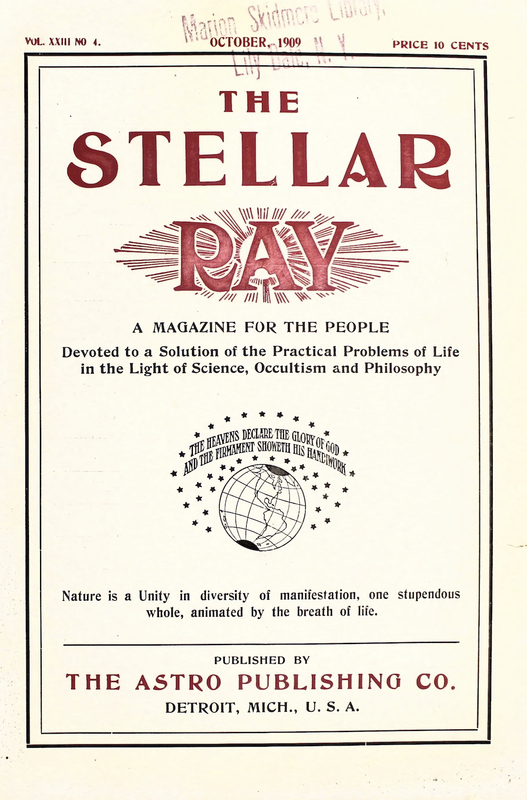 Higher Thought, Philosophy, Modern Menti-Culture, Practical Psychology, Physical Upbuilding, Astral Science, Occultism, Optimism, Opulence / A Magazine for Thinkers / A Magazine for the People, Devoted to a Solution of the Practical Problems of Life in the Light of Science, Occultism and Philosophy / The Oldest and Newest Thought in the Line of Progress. Detroit, MI. Publisher: Astro Publishing Company. Editor: Henry Clay Hodges and M.J. Murphy, Herbert Parkyn; Emma Hodges Williamson, assistant editor. 17/6, December 1906-33/2-3, August-September 1914. 32-52 pp., 7x10; $1.00 a year.